Anyway, there I was shimmying across the floor on the arm of a handsome hunk. I was wearing some designer number and really, really, really enjoying myself. I had sparkly shoes and my feet felt so light you wouldn’t believe. Then, of course, life intervened as it always does and I woke up. The big problem with dreams like this is that you feel that if you could only rewind life like a video tape it could have been real. Still, mustn’t dwell on it. I’m not one of the official dancers in the family so I’m probably not entitled to have those sort of dreams. 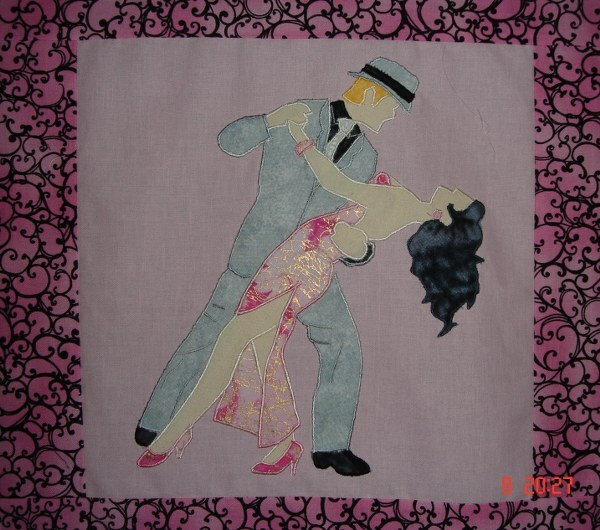 One year I joined Angie Padilla’s site solely because she had one particular quilt pattern on it. After I had joined I found other things but at the time I had to have this pattern. 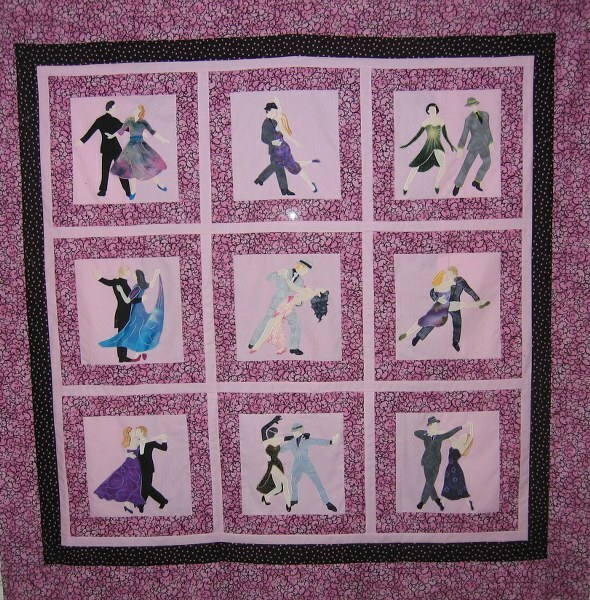 Daughter Number one was, and still is a dance fanatic and I wanted to make her a quilt with dancers. This was a way of making it quickly without having to design it. Lazy! It was great fun to make although I was still learning to use satin stitch so some of the small bits were a tad challenging. For some reason she also had a thing about spiders and the spider’s web fabric just jumped out at me on the shelf. I think it makes a very appropriate base fabric for the blocks. 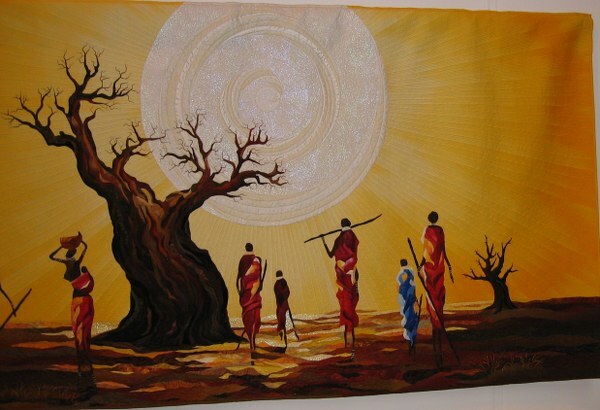 The dancers seem to be emerging from the threads. Or maybe I am just finally going batty and imagining things. See what you think. 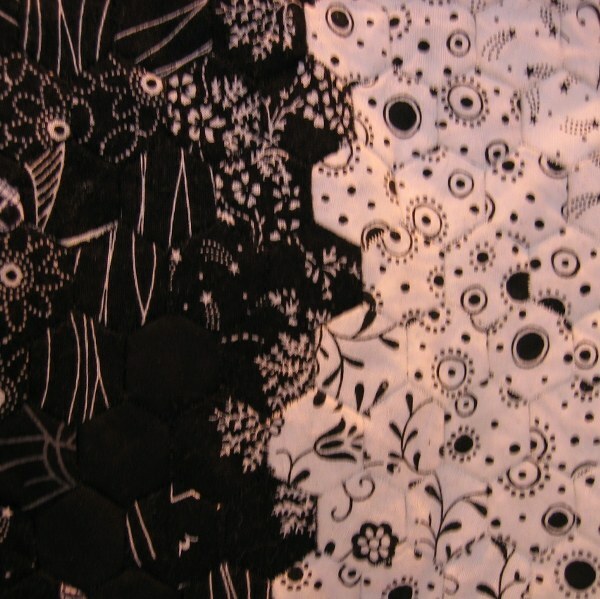 One tip I will pass on is that if your fabric is black, white wadding can be a problem. However I had to use what I could get so the tiny threads ‘bearding’ through the top could be due to the quality of the product. I think this one is so elegant and you can almost see the movement in the ball gown. Bit of contortion involved here methinks. I seem to have left a thread on that one when I photographed it. I think Daughter Number One might call the gentleman above ‘sketchy’ – a very descriptive word I always think. This one could be decribed as 'rubbery'. 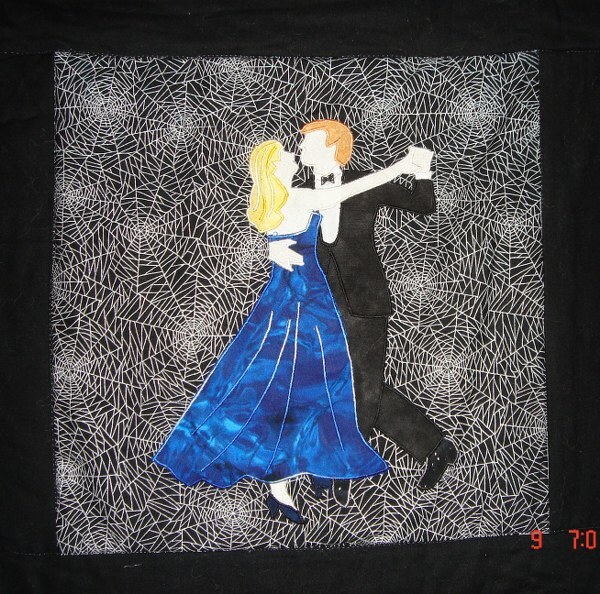 I haven’t got a photograph of the whole quilt in black, after all I didn’t know I was one day going to blog. I made one in pink for someone else so you can see the layout from that. 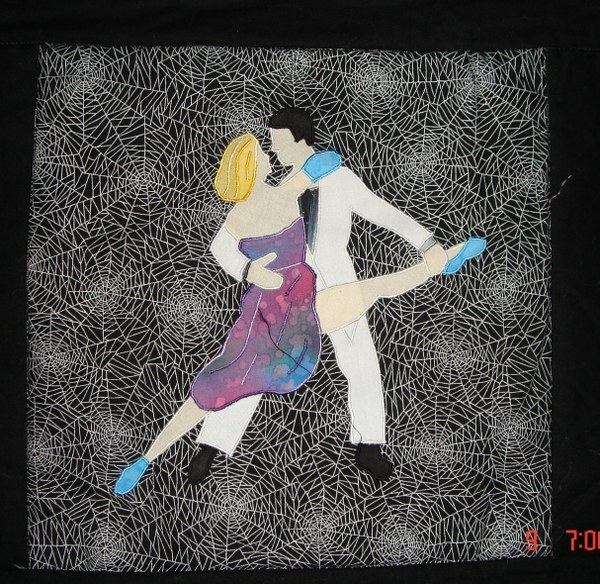 The different choice of colours makes it into a completely different quilt for a completely different dancer. I think this one was ordered for a little girl. To show the difference with the black one. I got the arm a bit shorter on this one. I had a lot of fun stitching the folds and shading to give texture. I didn’t choose the fabric for the pink version. 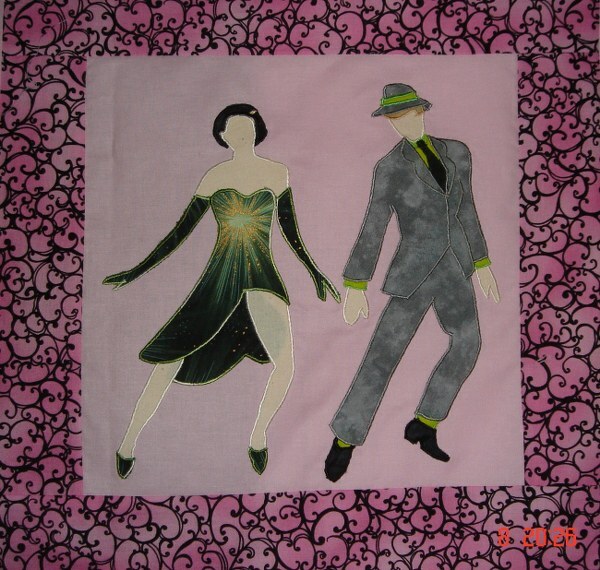 I think, given a free hand, I might have reversed the fabrics and had the dancers on the patterned fabric and the sashing in the plain pink. 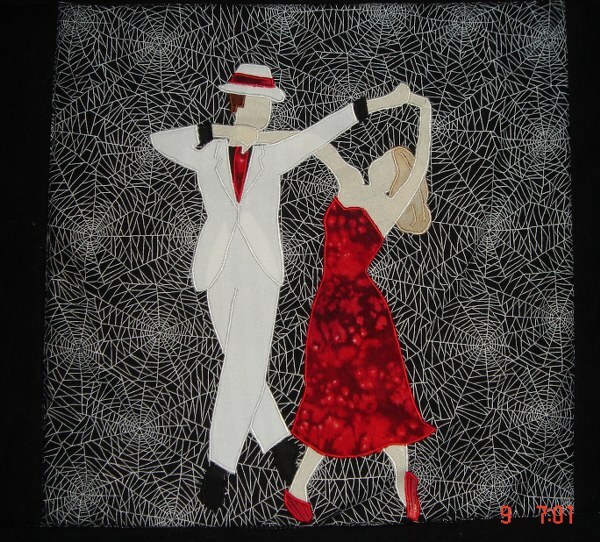 Sometimes it is liberating to use another person’s fabric choice. It gives another perspective, a way of doing things that might not otherwise have been considered as an option. 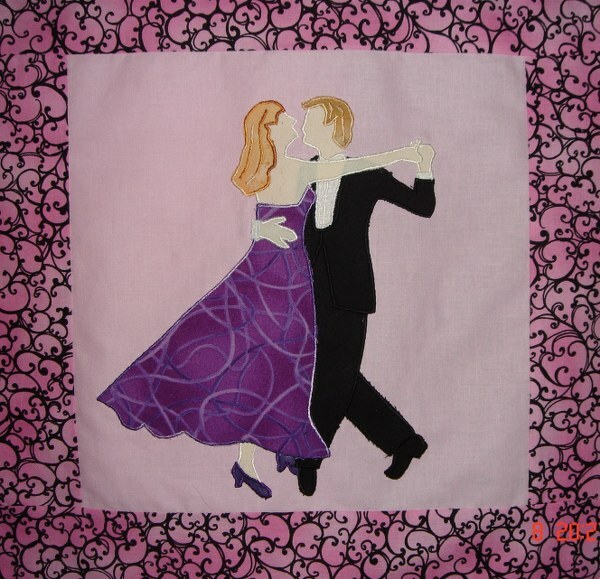 As you can see there was also a black fabric with pink spots for sashing which contrasted nicely. 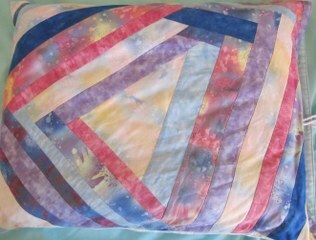 In all it turned out well although I never saw it quilted. I couldn’t finish it as I didn’t have a walking foot and didn’t want to spoil it using an ordinary one and so someone else took it to finish. 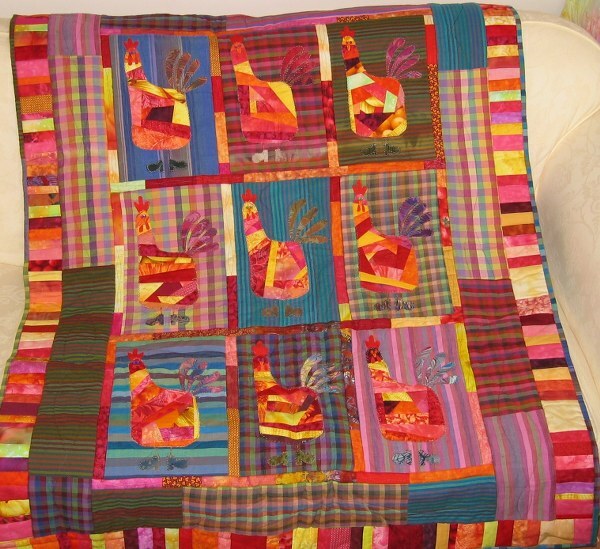 I would think that, if the quilt takes your fancy you could perhaps still get it on the site in the back catalogue. Shimmy over and have have a look anyway. 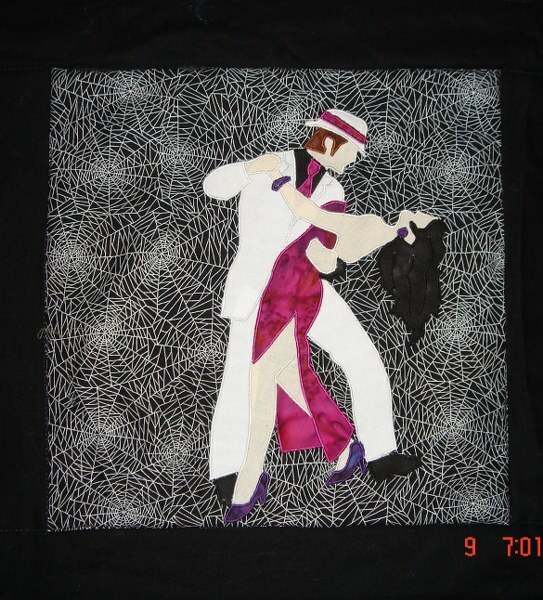 Angie Padilla uses the EQ software so you don’t really see finished quilts but there are lots of ideas if you like her style. (Ajpadilla.com) Dancers Link in case you can’t find it. 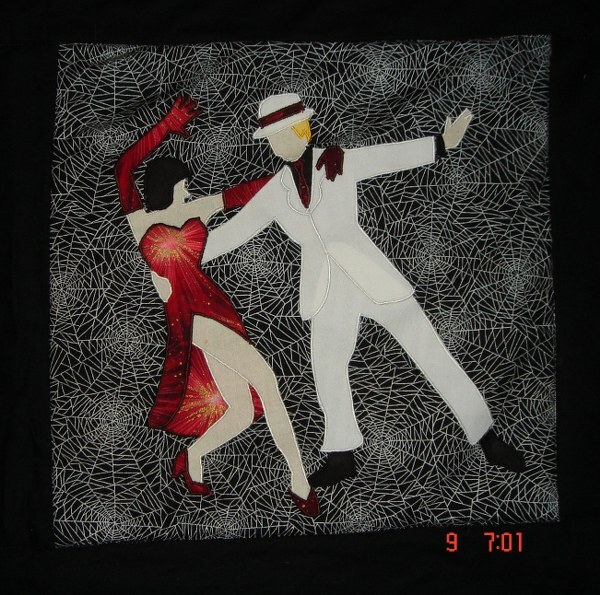 I have given daughter Number One who is the graphic designer, a brief to design some dancers for an Nsaa quilt. I have already purchased some glittery fabrics and if I make it as a wall hanging I will very likey adorn everything in site with preciosa crystals. These are slightly cheaper than Swarovski crystals which is why I use them. If you do ever want to have a go with these get the hotfix ones and a wand. You would not believe what a difference a few crystals makes. I use them a lot on cards when I use an embroidery for the picture. The hotfix are a doddle. Daughter Number One used to use the glue on ones on her dance outfits as they were slightly cheaper. When I decided to use them I didn’t fancy that so I bought the wand and hotfix crystals and now she buys those too, they are so much easier and stay on better. I won’t get into that too much as I want to do a blog concentrating on crystals at a later date . Right now I will just see if I can grab 40 winks. Who knows what I might dream about this time. 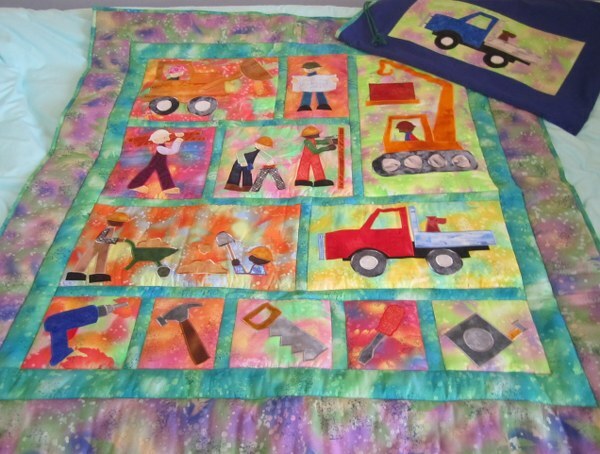 I promised you more car quilts and I always deliver – well almost always. 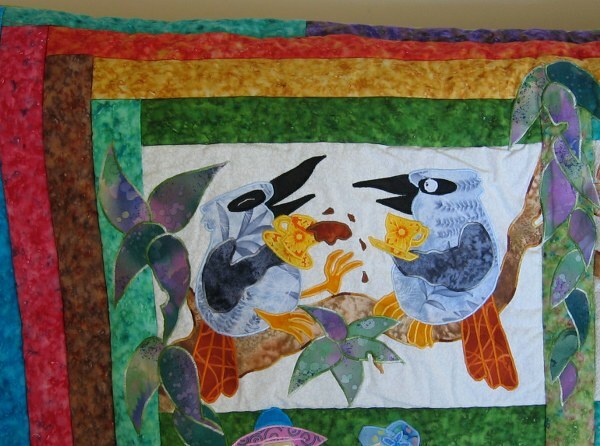 There is a little story around this quilt. My Daughters seem to like to give their cars nicknames. Apparently, according to a survey I read the other day, this makes them better drivers. I don’t award the grants so don’t shoot the messenger, just accept the findings. Daughter number one called her first car ‘Chick’n. 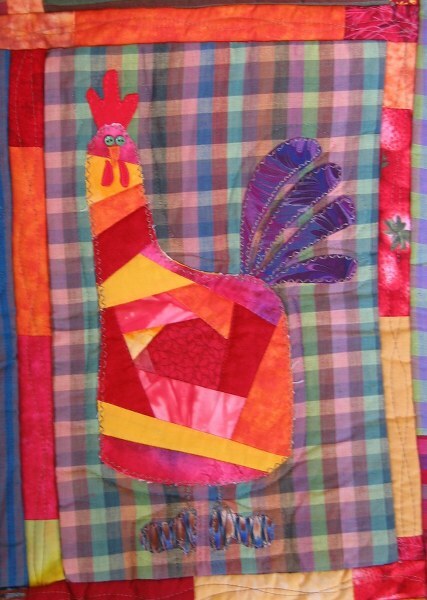 So, when I was making a car quilt for her it obviously had to be about chickens. I found a pattern whilst on one of my sojourns to Cairns in Australia. I know every fabric based business in that town let me tell you. 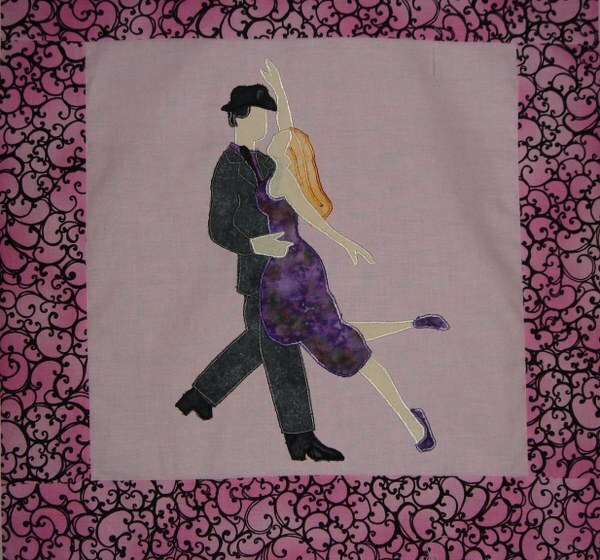 Anyway, I found this quilt pattern although I am not sure quite how as it was made up in dark purples and the pattern was in A5 size. If I hadn’t been looking specifically for that sort of pattern I probably wouldn’t have seen it. I suppose A5 takes up less space on the rack in the shop but it doesn’t do much for selling patterns. Anyway, I digress. I had taken a couple of bundles of Madras checks overseas with me along with the rest of my stash fabrics and found these perfect for the country style quilt. I made it up as per the instructions but I am not really happy about using zigzag instead of satin stitch. 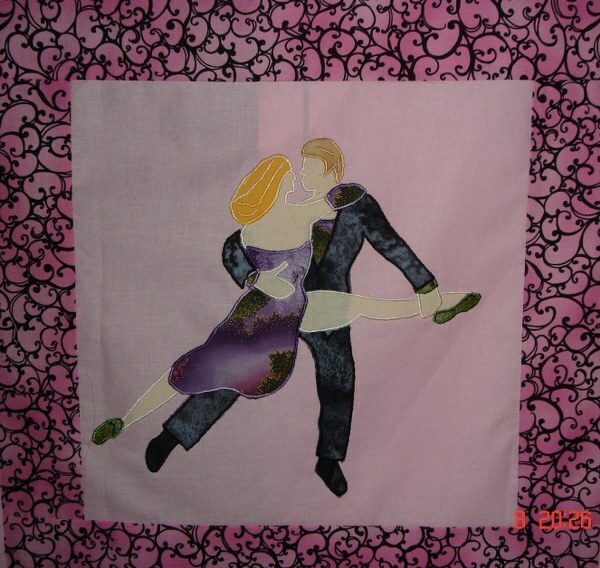 I think I made this before I had settled on satin stitch as standard. If it ever needs washing, which I am sure it will, I presume the edges will fray. this is apparently part of the design to make it ‘country’. Time will tell. 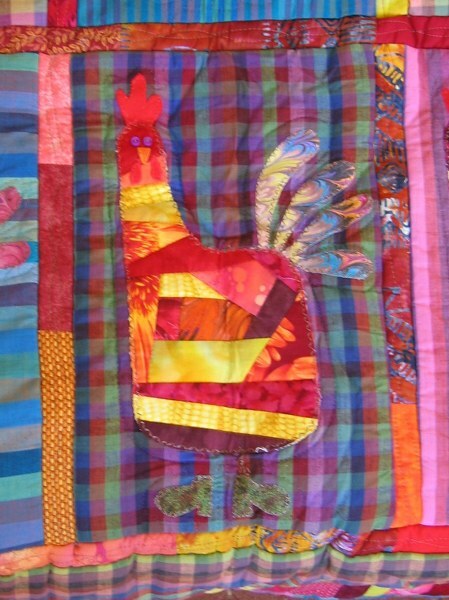 Here is a detail of the chickens. 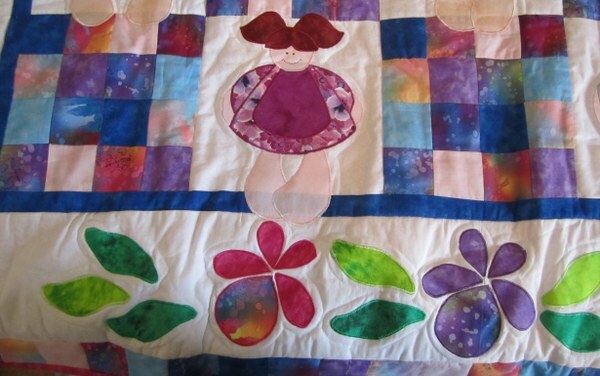 The buttons for eyes would not be suitable for a child’s quilt but they add something nevertheless. 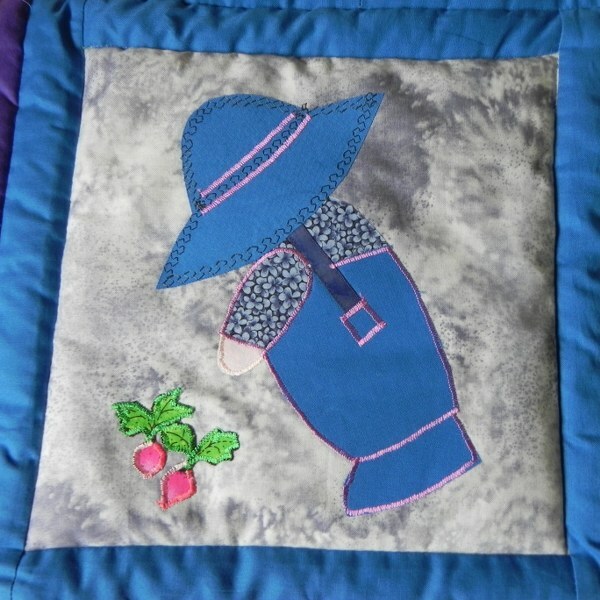 I mentioned in my last post on car quilts that the cover does not only keep the quilt tidy but also protects it from the sun if left on the back seat. (for those of you who are looking sceptical, yes we do have sun here sometimes). These next two photo show you the fading on the cover. 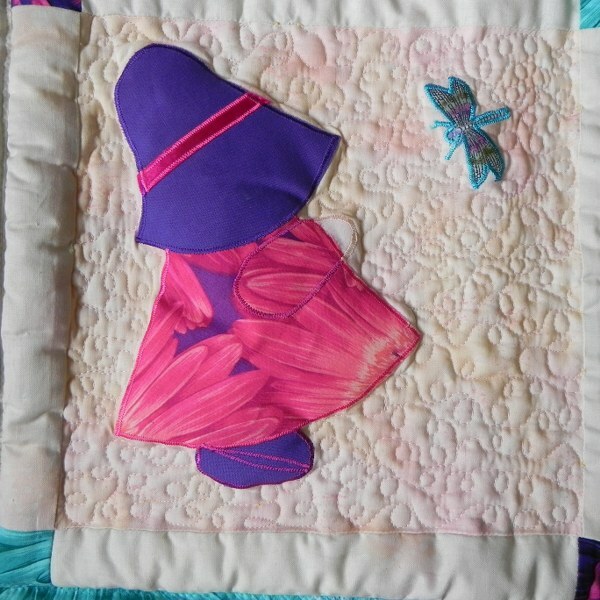 Both the front of the cover and the quilt were made from the same fabrics. The back was a mixture of completely different fabrics as, when you have limited supplies you tend to reserve fabrics you might use again. The crazy patch allowed me to use up lots of left over bits. 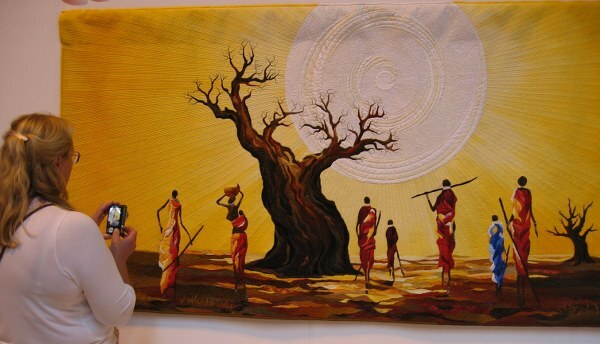 Daughter Number One is a Graphic Designer and like me prefers bright cheerful colours – probably the result of a childhood spent in Africa according to research material she used for her University Dissertation. This quilt must tick all the right boxes for someone like that so I was quite pleased with the result. Come to think of it being brought up in a sunny environment is obviously not a prerequiste for liking bright colours or I guess I would like dull browns and greys. 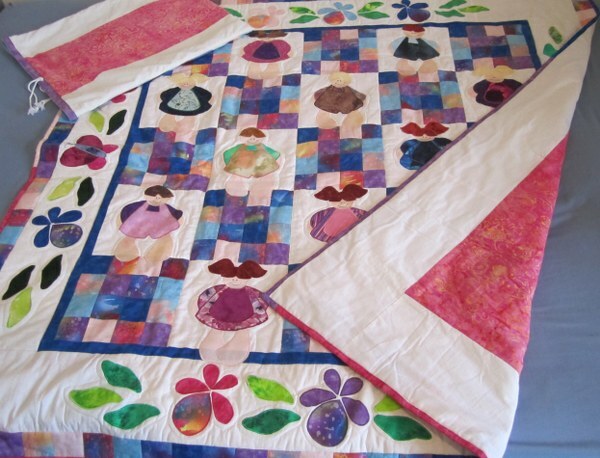 The quilt incorporates one of my favourite forms of patchwork – crazy patch. It is so useful for using up bits of fabric but doesn’t look as if that is what you have done. As you are using up leftovers the end result tends to be a snapshot of your taste in fabrics too. Very Freudian I’m sure. I will do a blog on crazy patch at some time I am sure so we can discuss the ins and out of that one. 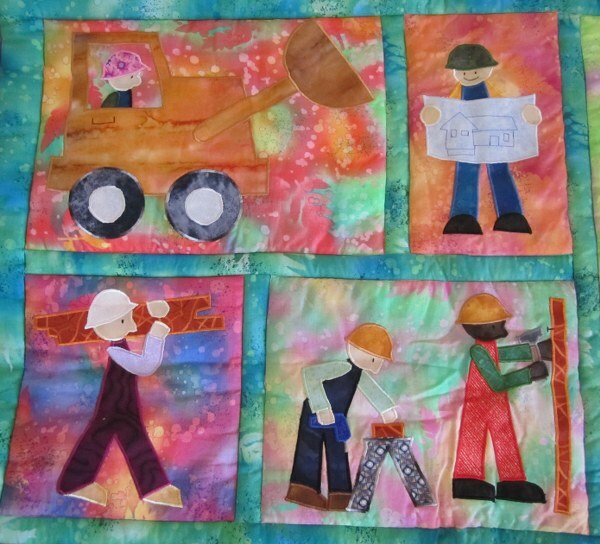 Whatever, hope you enjoy this little quilt and maybe it will inspire you to make your own car quilts. 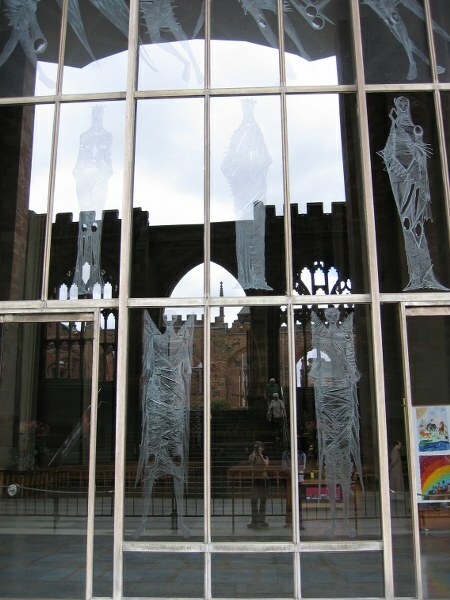 As I mentioned in my earlier blog; day after the International Quilt Exhibition daughter Number One and I went for a bit of a sightseeing trip round Coventry (in the English midlands for those outside the British Isles) and took a few photographs. As I also mentioned our feet took a bit of a hammering thus the title of the blog – The Barking of the Dogs. Walking round what is a busy town,what struck me most was that as we walked into the Cathedral area it suddenly became very quiet. All sounds seemed to fade into the background. 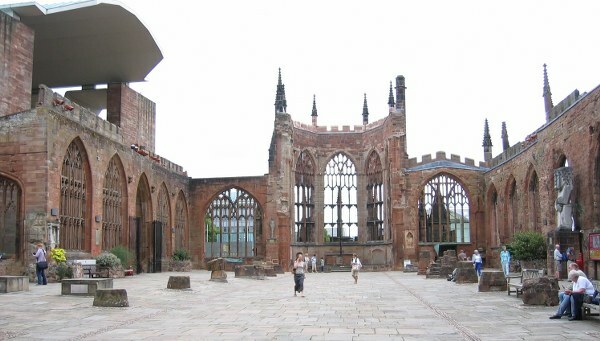 You may or may not know that the original cathedral in Coventry was bombed in the last war on November 14th 1940. (See this link if you are interested). The building was destroyed. As you can see it must have been a very lovely structure. 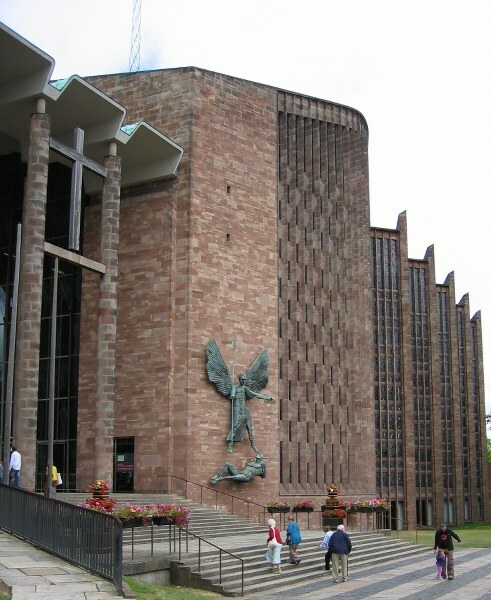 The foundation stone of the new Coventry Cathedral was laid in 1956 and the Cathedral was consecrated in 1962. (See this link for more details if you are interested.) It was built in a modern style that I think has stood the test of time. 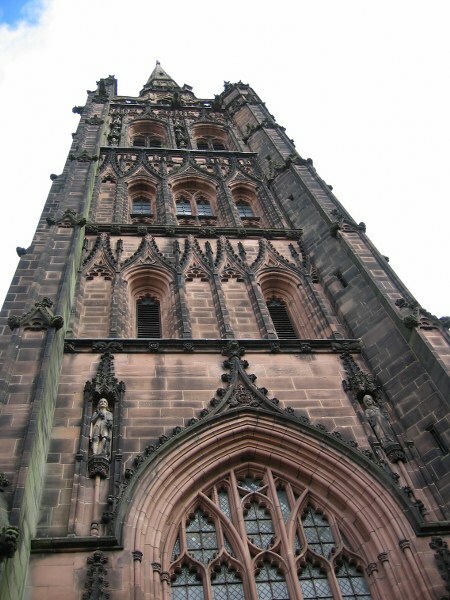 There were some awful examples of architecture built in the UK in the 60’s but this one seems to have managed to be attractive and definitely not outdated to this day. This statue depicts St michael and the Devil. Can you see the photo being taken. Note I have stayed incognito. Here are a couple of other general photos. I remember thinking what a wonderful place it would be just to go and think. Although there are people there it is so peaceful. So if you are ever in the area you know where to go for a ‘piece of quiet’ as Daughter Number Two used to call it when small. When the Clock Strikes Three, Everything Stops for Tea. Personally any time the clock strikes and in between time suits me. That is a little strange as my Anglo-Saxon roots are well diluted with potatoes and stout. There must have been an ancestral teabody who passed down the gene undiluted. I suppose I’m lucky it wasn’t the one with a penchant for moonshine. Having this predeliction and also a stash with some flowery fabrics bought in a fit of something I cannot quite remember, the Millamac ‘Tea Party’ quilt was a bit of a must. I made it for Daughter Number One who could really do with an intravenous drip where tea is concerned. I don’t think she would go for the moonshine but you never know till you try. You certainly wouldn’t be wanting to take that intravenously. 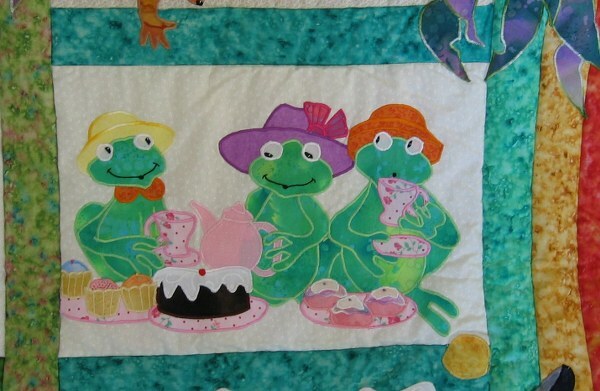 This quilt is called ‘Tea or Coffee’. I saw it advertised as a block of the month as ‘The Great Aussie Tea Party’ which I think has a bit more ‘Zing’ as a title. 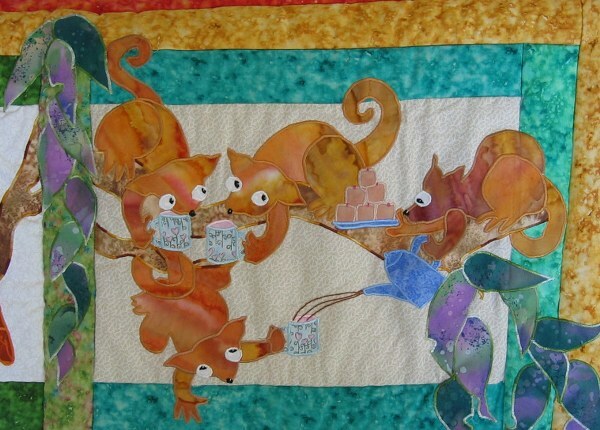 It shows various animals, birds etc taking tea – as they do. The comment from the Australians that I showed it to was that the fabric made the teapot very ‘English’. I think they were thinking more ‘English Stereotype’. Personally you wouldn’t catch me with a pink flowery teapot but that is called interpretation. There are times when I think I live on a different planet from other people. I just broke off then to look out of the window as I heard a car. This may not be something that you would necessarily do but then you may not live on a street that is too narrow for cars. That does not stop people trying to drive down it though. They think if their holiday cottage has parking it must be outside the front door. This is a grievous error. There are railings outside my house By the time they realise they can’t get through and try to reverse, their wing mirrors perform like a child’s ears when he has stuck his head through the railings – they won’t go backwards. Still we don’t get a lot happening here so it all adds to the entertainment. It doesn’t do the paintwork a lot of good though, the railings or the car. If you go to the Polperro website you will see a couple of pictures of unlikely vehicles using the roads but in fact the road past my house is even narrower and they would not even have tried it. At least I don’t think so. I think there is a bit of a macho element that thinks it can drive anywhere despite signs to the contrary. However, back to tea time. 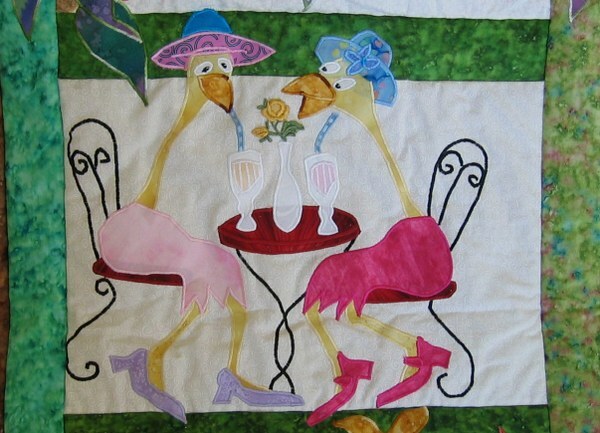 I rather like the kookaburras who are having such a good time the tea is getting spilt. 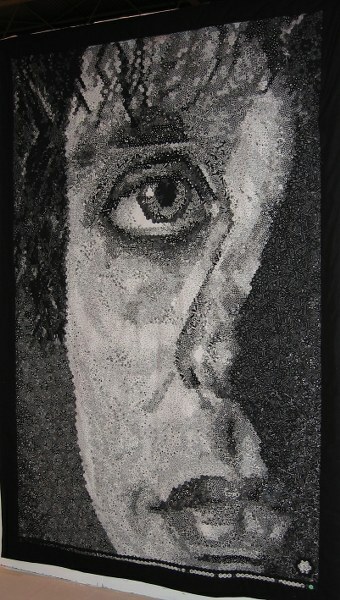 The slit of an eye makes all the difference to the expression. The one on the right seems to have told a very funny story. In the next one the possum on the right is a busy little fellow. Pouring the tea and handing the cakes. If you are interested the cakes are called ‘Lamingtons’ and are plain cake dipped in chocolate and sugar and coated in coconut. Click here for the recipe and the theory of origin. They may sound a little odd but they are strangely delicious. 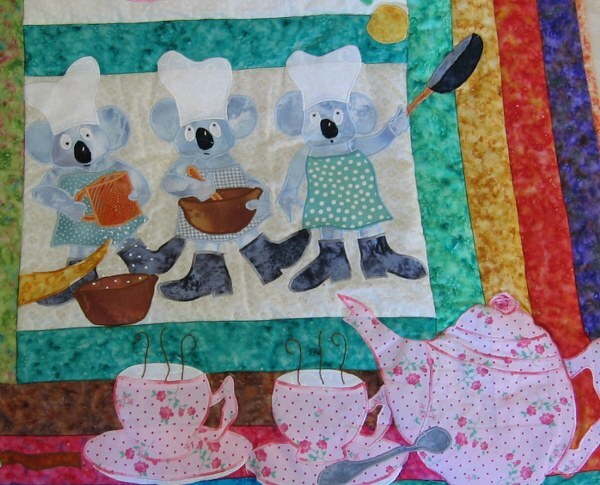 Then there are the koalas tossing pancakes into another block. See the expression on the face of the one tossing the pancake and the other watching it go whilst the third sifts flour. Lots of french knots there. Please note the steam from the coffee. A bit of backstitch there. Then there are the ’emus what lunch’. It looks like milkshakes rather than solid food. I expect there are some of you that think I hand-embroidered the chairs. I don’t think so! Satin stitch on the machine. I don’t mind french knots and a bit of backstitch but I have to draw the line somewhere. The frogs were great fun. Just look at the one on the right. You can see her pursing her lips ready to drink the hot tea. Attention to detail like that puts the expression and humour into the picture. 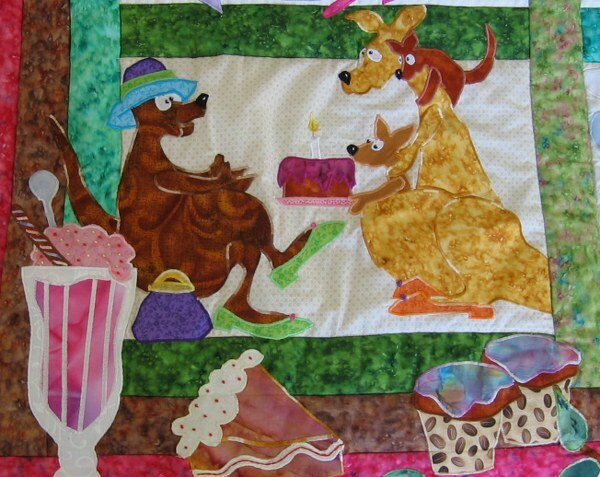 This is a quilt that makes you laugh. Down at the bottom left it looks like Granny’s birthday with Junior delivering the cake. A very tactful one candle I see. More french knots on the cake and sundae in the foreground. They almost look good enough to eat. The border fabrics were a jelly roll I just happened to have . I probably wouldn’t have thought of that fabric if I hadn’t had it in a jelly roll but I think it makes it. 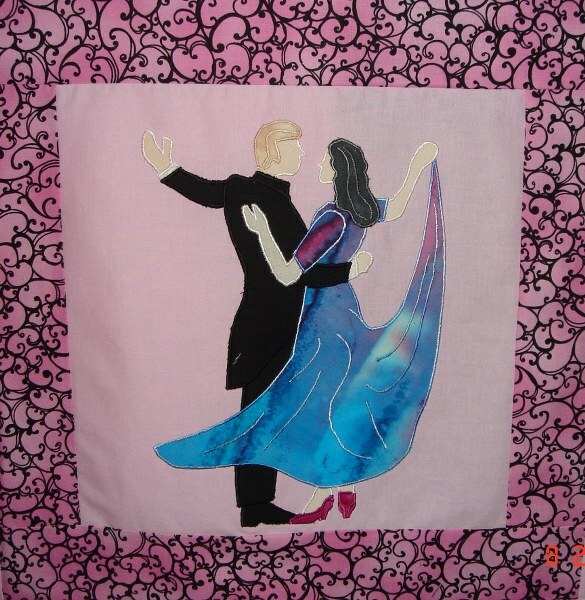 Someone asked me to make them a similar quilt but in creams and browns. It was a struggle bearing in mind the way my colour tastes run but I did it and it looked as good in its own way. Unfortunately I didn’t take a picture of it so you will have to take my word for it. Well I think it is about time to put the kettle on so I’ll love you and leave you as they say. I wonder if I can find some cake. Daughter Number One and I went to the Festival of Quilts this weekend in Birmingham (England not Alabama). By the end of the weekend our feet certainly knew about it. 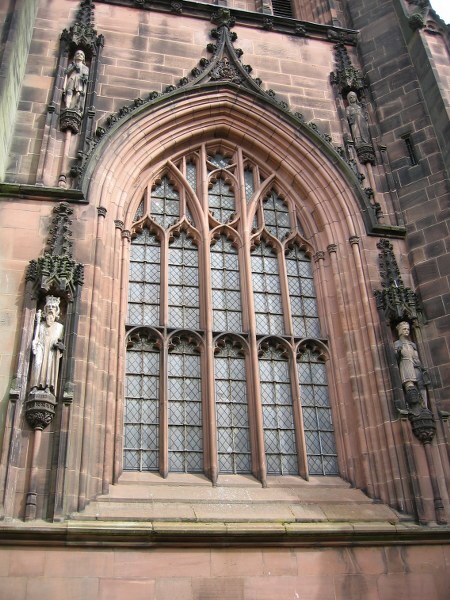 We were staying nearby in Coventry the home of Daughter Number One’s Alma Mater. As this was the case, after spending 7 solid hours on Friday walking round the exhibition we obviously decided that an equivalent number of hours spent walking round the city taking photographs and generally visiting old haunts on Saturday would be a good idea. Enjoyable though it was the feet definitely protested. As you can see all the sharpening of elbows and avoiding of buggies at the exhibition was definitely worth it. There were some beautiful quilts. Some I liked, some I didn’t but I expect that everyone felt that way and there was something for everyone. I have included some photos of a couple that I thought were just so well done I could never hope to compete. The patience some people must have transcends anything I could ever aspire to. Try this one for size. It is made up of, I assume, thousands of hexagons that I would estimate to be about 1″ in size. Hours and hours of work. This photo is a bit blurry but you get the idea. It’s not that I couldn’t do it just that I think I would lose the will to live halfway through. Also I expect I would make a horrendous miscalculation somewhere and mine would end up with a broken nose or something equally ruinous. In my opinion it should have won a very big prize. If it did I must have missed the plaque. Please correct me if I am wrong. Another item also caught my eye. 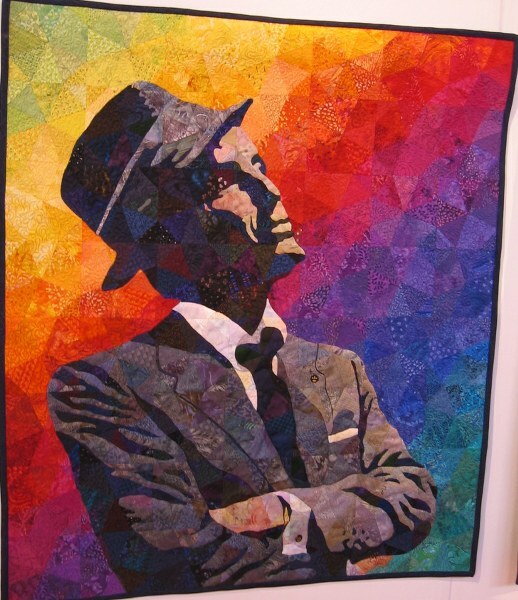 This time it was a group of three wall quilts depicting Frank Sinatra. They were beautifully pieced and in just my range of colours. There were a lot of people there and it was not wise to turn round too quickly or step backwards but we managed to get round without a mishap unless you count the feet. There was even enough room in one of the tea areas when we just had to sit down and refresh ourselves. What more can one ask. We were there just after it opened and left just before it closed so it must have been good – or very big, or both. On the way out we took pictures of the big winner which was beautifully conceived and crafted. 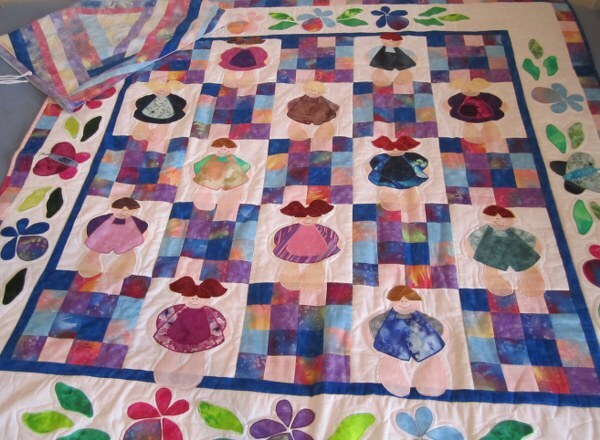 Apologies if you see your back view in one but it helps to show the size of the quilt having someone in the foreground. In a later post I will post some pictures of the tourist route we took. On another subject. 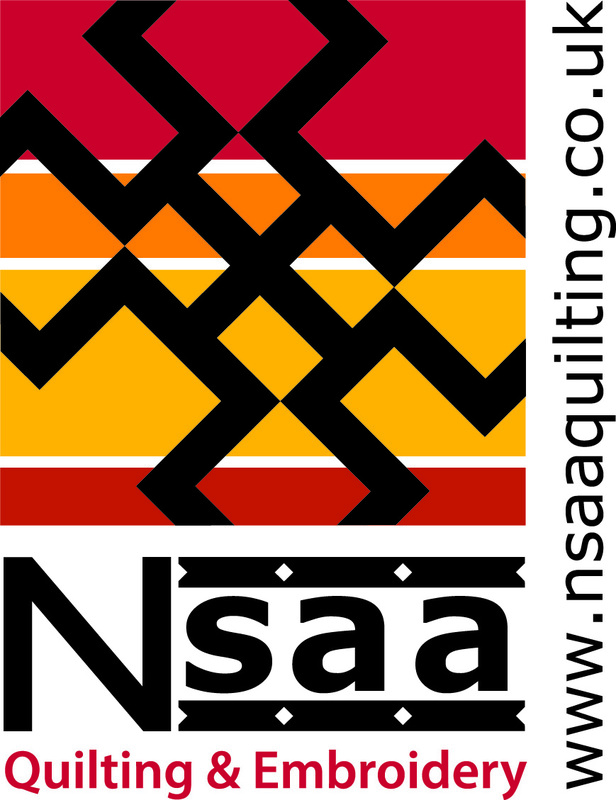 I am sponsoring a quilt competition over at Quilting Gallery this week. If you don’t want to enter it is always worth going over to have a look at the things people are making on a certain theme. Picture the scene – the snow is falling, the temperature is dropping, the traffic in front comes to a halt and there you are in a weather induced jam. You can’t go anywhere, and it’s cold. I do realise that if you live in Queensland this could be a bit of a stretch but humour me. As time goes by the temperature drops even more and you haven’t even put a coat in the car as you weren’t going far. This could become a very big problem as the snow ploughs take their time and it gets darker outside. In my case this will never be a problem. I am one of those people who see everything coming, even things that never do. As a result everyone in my family is provided with at least one car quilt. What, you ask is a car quilt? 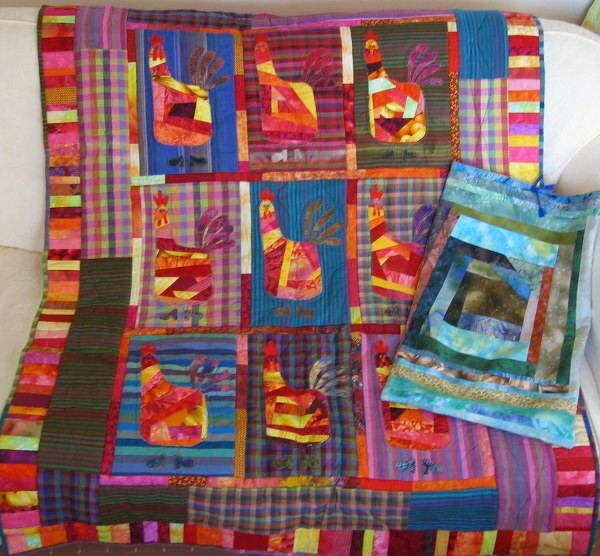 The answer is that it is a variation of the quillow – the quilt that folds up into an attached cushion cover. I tried the quillow idea but as I tended to use hi-loft wadding which was the only type available to me at the time, these quillows tended to be a bit unmanageable. I also wanted to make a quilt and then decide on the size of the ‘cushion’. This resulted in the car quilt which is basically a quilt in a matching pillow case. This keeps the quilt folded in place and clean and also protects it from fading if kept on the back seat for any length of time. 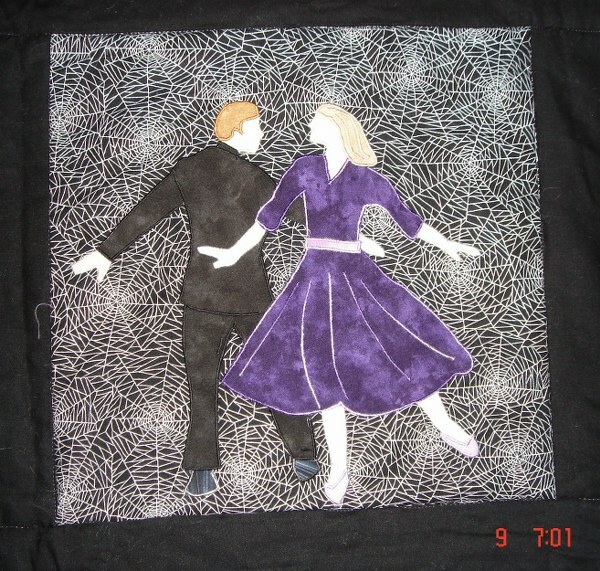 I usually use calico as a base and stitch the outside fabric on top. This gives a good, solid construction. Car quilts can be any size. A useful size is one to go over a child’s knees in a car seat. They can also be as large as a bed quilt if necessary. 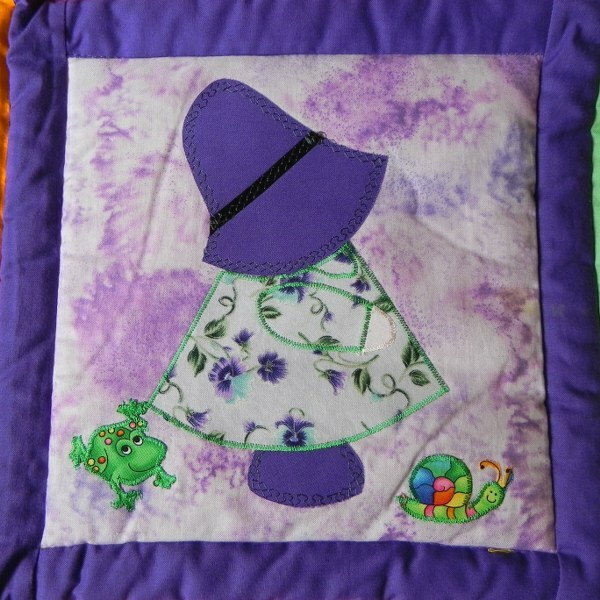 Folded up in the case a car quilt provides a great pillow for children (of any age) to use when falling asleep in the car. They can also be used to cover up a sleeping child. If you have two you can do both. What a cosy picture, I almost feel like going for a drive – except that I don’t , drive that is. I can but I don’t but that’s a different story and totally irrelevant to this one. Obviously any quilt pattern would do but I thought you might like to see some of mine. 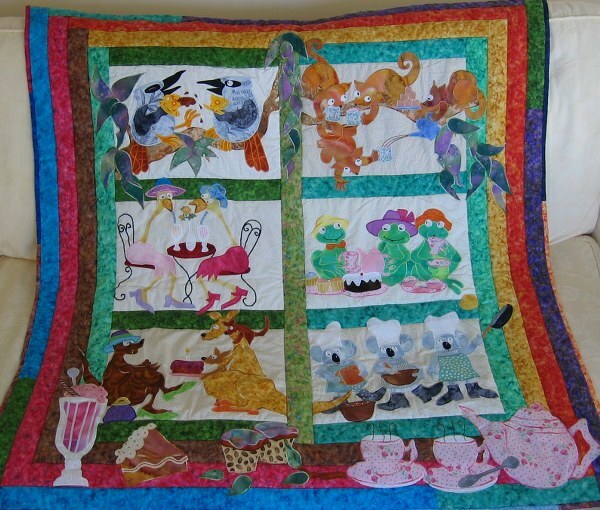 The first picture is of a quilt I made for Number Two Daughter. She is a civil Engineer and had a cold site hut so it came in handy for keeping the knees warm. As it is a car quilt it means that she always has it with her. As one of her other interests is dancing she always has extra bedding to compensate for inadequacies of same on dance weekenders. Versatility is the name of the game. I made this quilt from a pattern by Smee Designs in Australia. 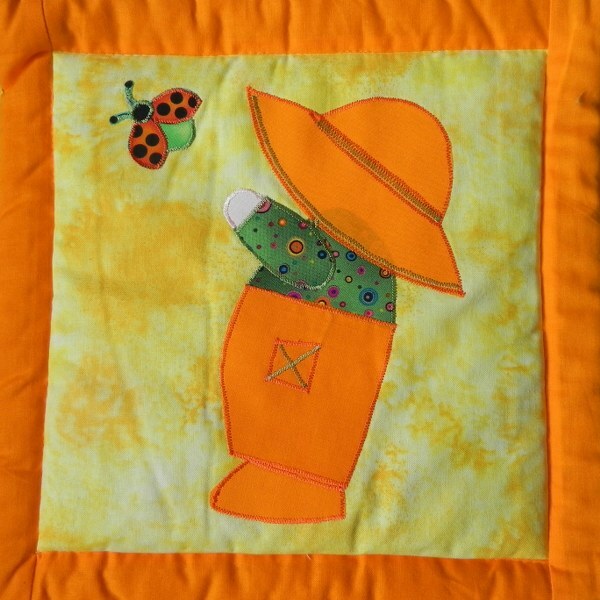 I then tied in the case by decorating it with an applique from the quilt but changing the colours. 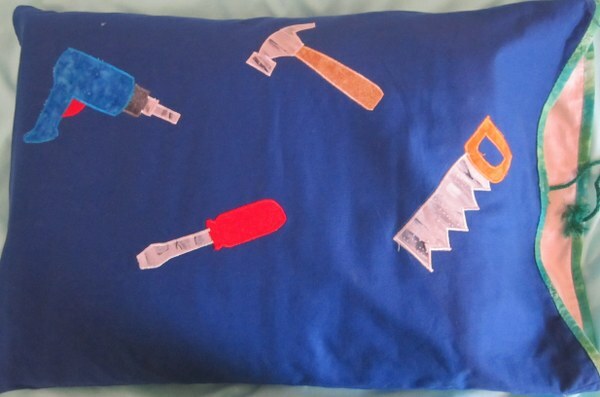 On the back I put the tools that you see on the bottom of the quilt. It can be great fun and there is a danger of getting carried away but who’s looking. 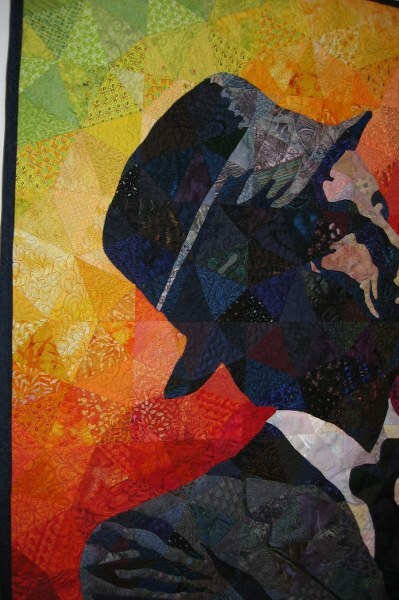 Here is a detail of the quilt. What busy little bees they are. Do you think the Engineer knows he has the blueprint the wrong way round. Or maybe it’s just the light shining through. If you are wondering why the digger driver has a flowery hard hat, it is a bit of personalisation. When Daughter Number Two began to work for a contractor, Daughter Number One who is a graphic designer decorated her a hard hat, painting it pink and sparkly with little flowers all over. For those in Health and Safety , never fear she doesn’t wear it on site. Anyone who read my last blog will recognise the background fabric as Fossil Ferns, I told you it was versatile. If you look at the original pattern on the Smee Designs link above you will see what a difference using different fabrics can make. It also shows you that you do not have to copy the original if you do not want to. Two interpretations for two different tastes. 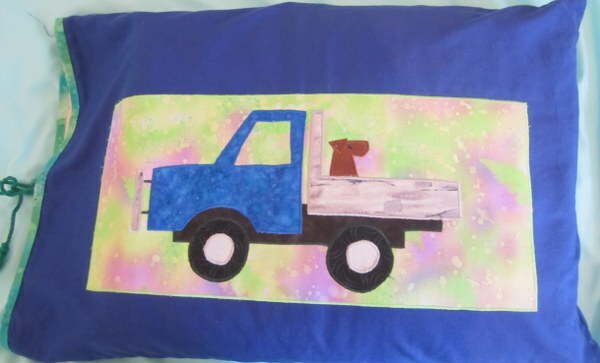 Truck with Dog but different colours. I made another one, also for Daughter Number Two, with a completely different theme. 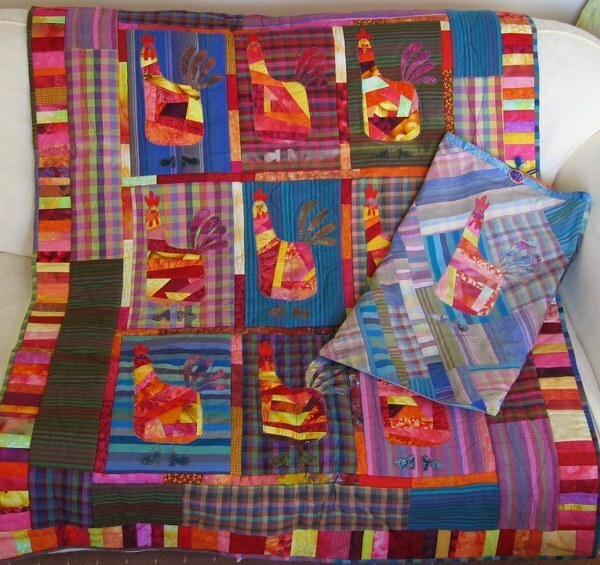 This one was clean, bright colours from a pattern by ‘Country Cupboard Designs’ also in Australia. With this one I matched the backing and the case. 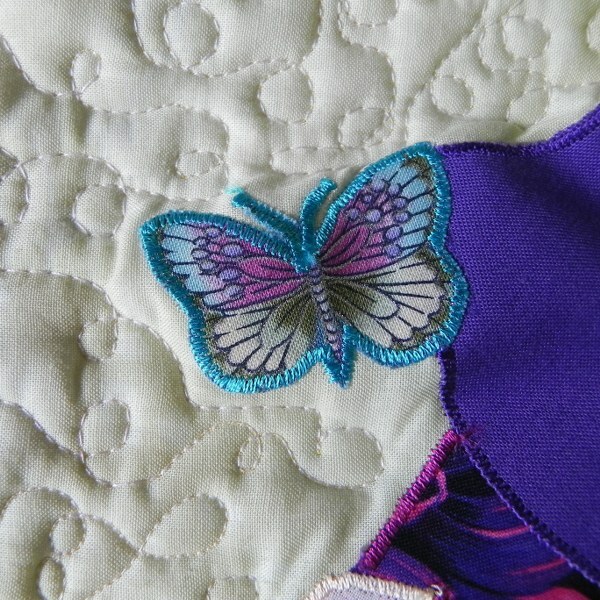 Here is a detail of the border which I think transforms a simple 9 patch pattern into something really special. (Fossil Ferns again). The front of the bag on this one is crazy patch which is a good way to use up small pieces of fabric or leftovers from the quilt. 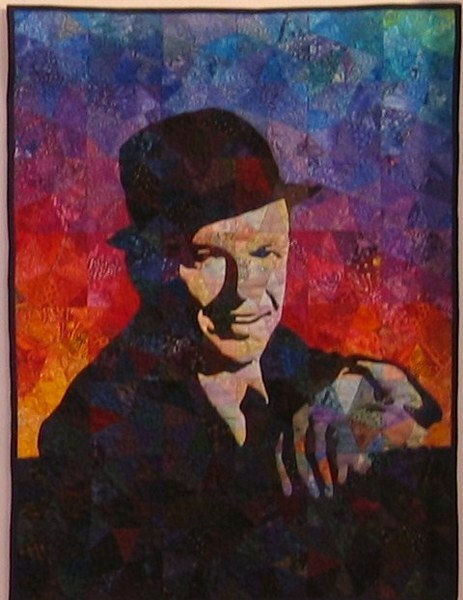 I have other car quilts that I will show you in a future blog. Don’t want you to get too excited all at once. Apart from that I haven’t managed to take the photographs yet and I have to post and go. Who am I talking about? 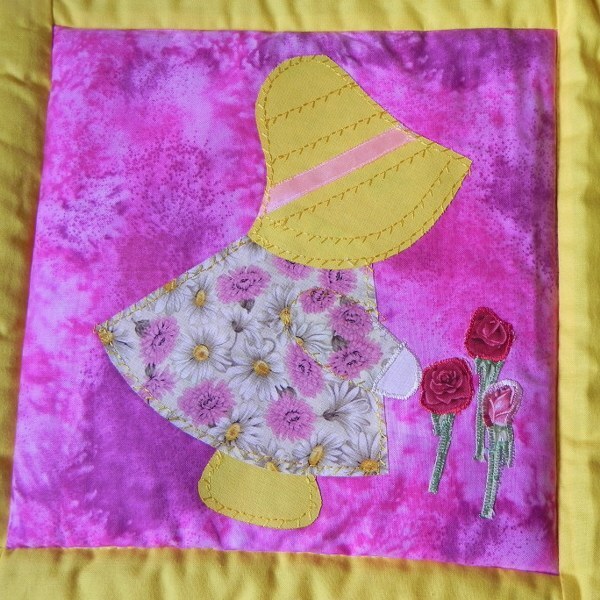 Sunbonnet Sue of course. 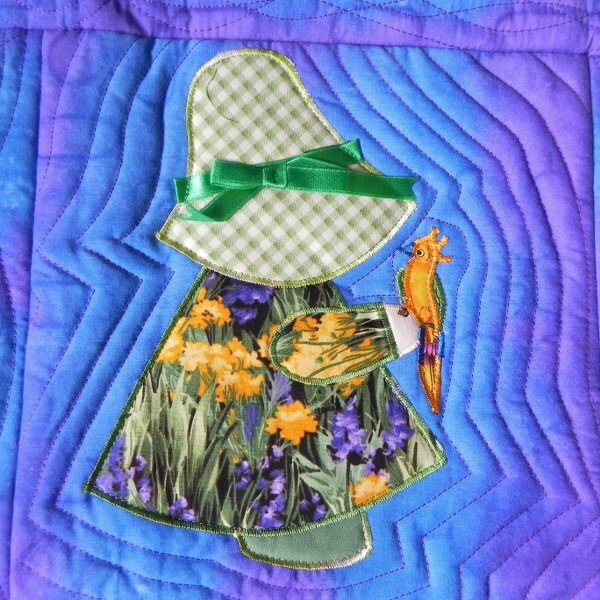 I have to confess that I am not enamoured of Sunbonnet Sue. I don’t mind Overall Sam or Fisherman Fred as Emblibrary calls him. I think the problem may be continually trying to see under the bonnet but as Sam has the same problem maybe it is something deeper in my psyche. better not go there. I will be getting spam from ‘analyse yourself’ sites. Whatever it is I find it a tad unnerving. 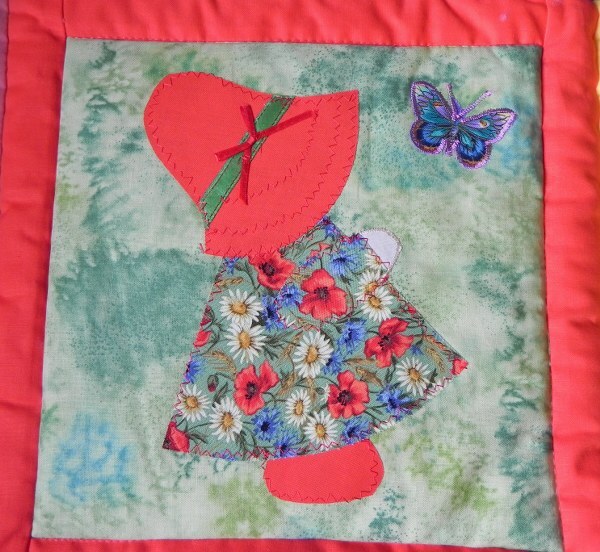 Despite this I enjoy making both Sunbonnet and Sam and embroidering Sunbonnet and Fred. 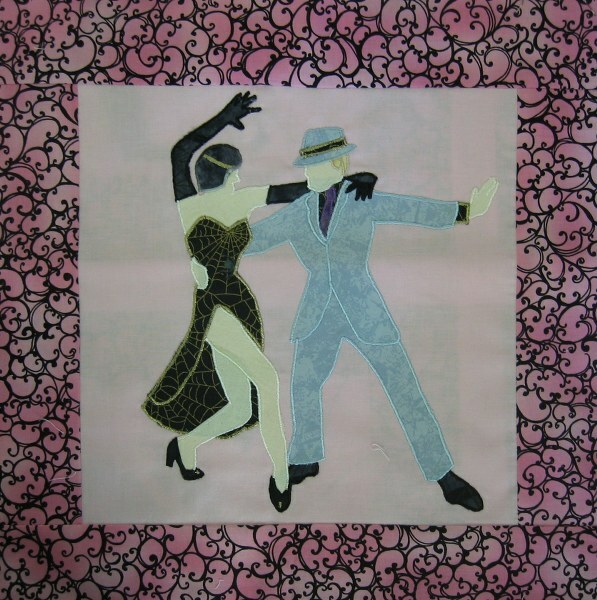 I had a spate of adding appliques cut from patterned fabric to brighten up the subject. It was quite a long time ago so I was still experimenting with stitches. I really should have got out more. However when you are stuck in the bush 6 hours drive from the nearest town of any size and when the drive really isn’t worth it you should be glad it’s only Sunbonnet Sue. I was trying out the embroidery stitch selection on the machine I had bought then. 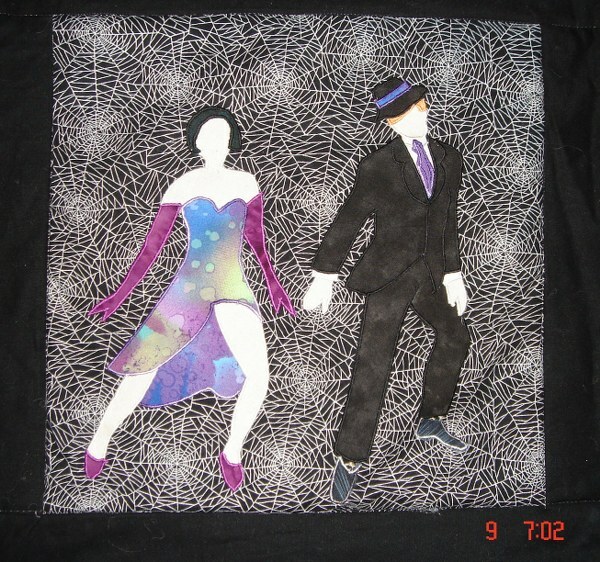 Sadly I wore out the zig-zag mechanism which is not surprising considering how much applique I did on it over the years. That one sounds like a good name for a kids’ story book. As you can see all you have to do is change the angle of the bonnet and/or body and it really looks as if they are interacting with the add ons. 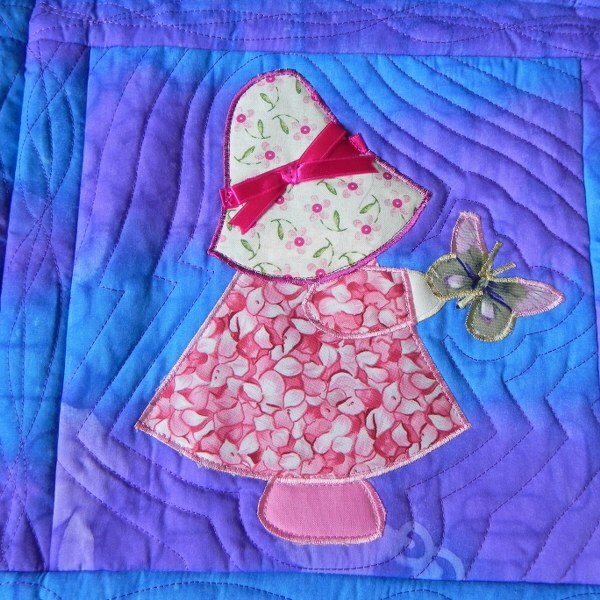 Having got the hang of Sunbonnets and finally settled on satin stitch as the norm I started trying a bit of random quilting round the body shapes. I was still experimenting and here I used a ‘lap lap’ from the local market in Papua New Guinea. I was desperate for any background fabric and in the end I think it turned out quite well. I had to do a fair amount of cutting and disgarding various slogans such as ‘Happy Mothers Day’ and various religious epithets but I got there in the end. 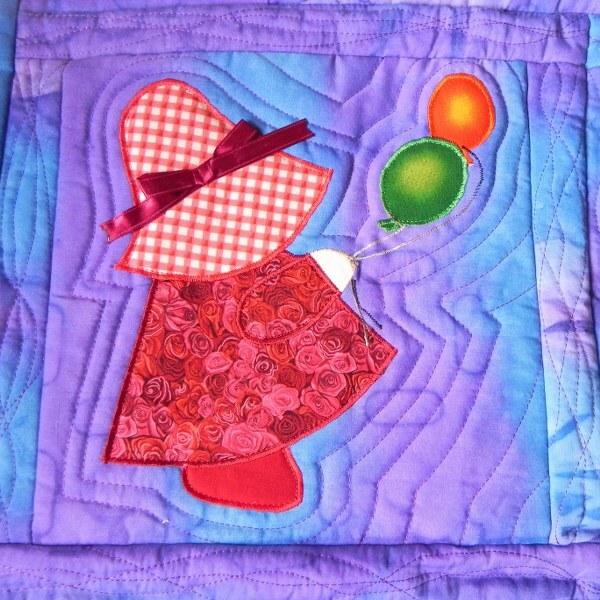 When you are a quilter no obstacle is unsurmountable. 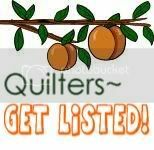 In the interests of honesty I think I might be a quilt topper rather than a quilter as I prefer the former to the latter but you catch my drift. I didn’t have any quilting thread or any of the mod cons I now have access to but it worked after a fashion. At the end of the day you can use what you have or not do anything so I used what I had in the true spirit of the quilting pioneers. Add a few cheery balloons. One for the bird lovers among you. 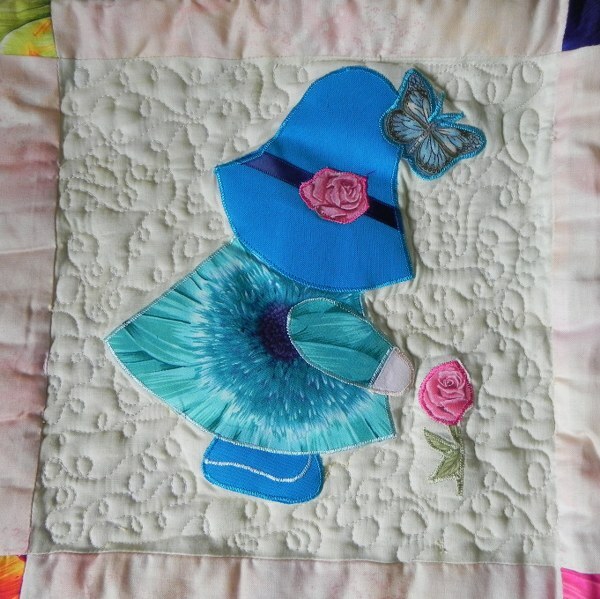 By this time I was getting a bit big for my boots and decided that I would like to do some fancy quilting. I bought myself a ‘Little Gracie’. I’m afraid I should have saved my money. I even bought all the extra little bits to do pantograph. I have bought so many things over the years that did not live up to the hype that I carefully went into the details before buying. Unfortunately it’s not until you start using something that you see the drawbacks. Perhaps lessons would have helped. However seeing all these old quilts is making me want to get the frame out again. Maybe I will have another go. I have so many tops to finish I really should get on and do them and you can have too much ‘stitch in the ditch’. Could I stand the stress? Skilled at quilting on the frame I am not however, if you want twiddly bits you can have them – witness. I got a bit carried away with the extras on this one. 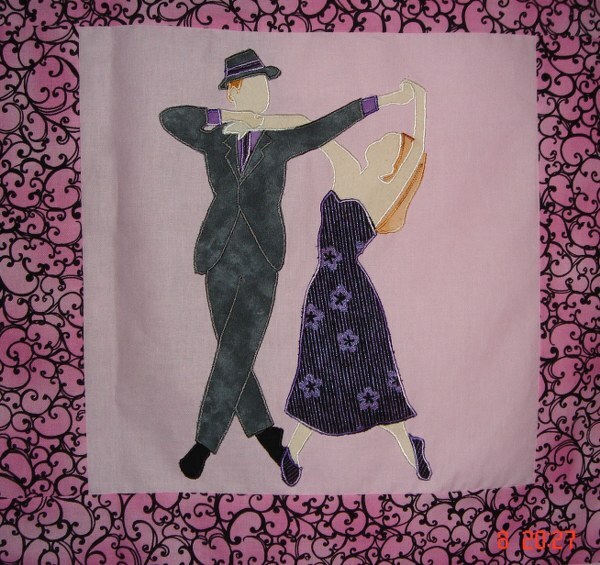 You can only look at this one if you remember it was done before I worked out the technique for perfect satin stitch. 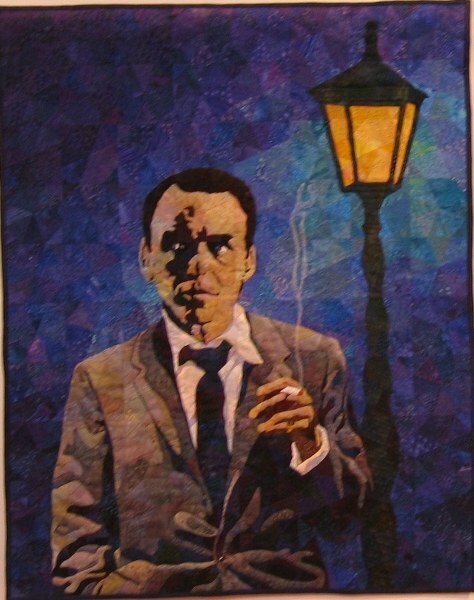 Detail of Quilting on Frame. 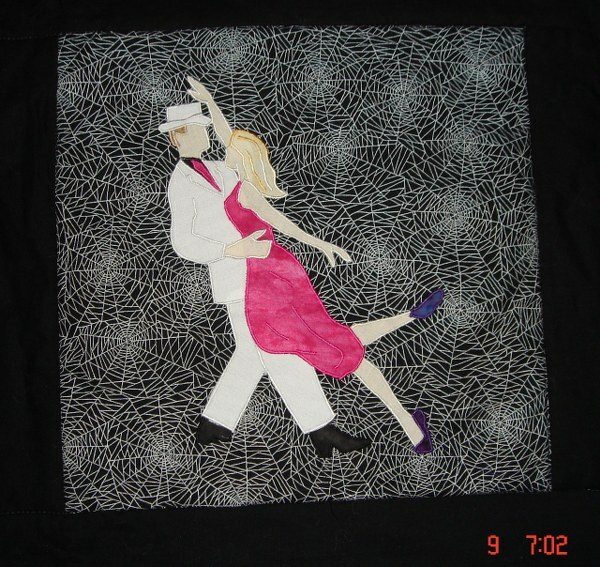 This type of quilting makes the figure stand out in relief by flattening the background. It works well with the Sunbonnets. I thought it was quite dandy as a look but I heard someone recounting how a longarm quilting service had ruined her quilt by using this technique round teddy bears on a Kidsquilts pattern. 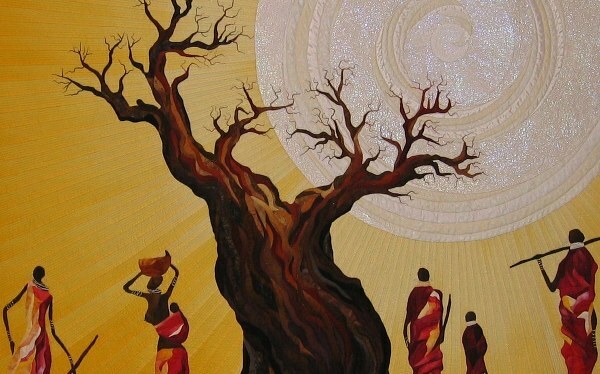 It just shows you that there are many different people in The World and they have many different ideas. Never assume that what you like or think is good will fit with other people’s ideas. 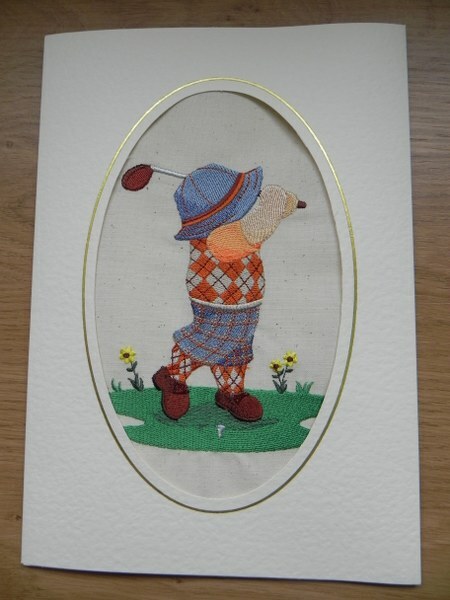 For an example of the embroidered Fisherman Fred – The B.C.s birthday card. Stop press: I think I might have found someone to take my quilt tops off my hands. I contacted Project Linus in UK and they say they can get them finished. Good result for me and for them I hope. I still ought to get the frame out again but the pressure is off a bit. I hope you have enjoyed this little meander through my archive of Sunbonnet Sue and Overall sam . Whatever else you say about them they are easy to produce and, as you can see simple though they are , a bit of customisation makes them unique to you. 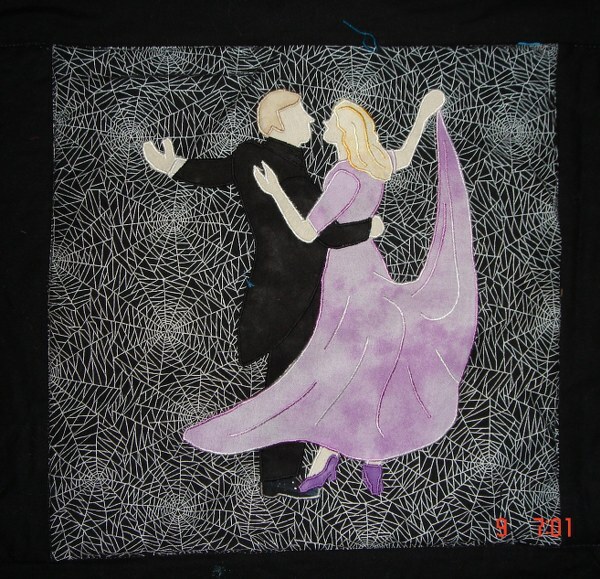 Seeing the applique fabrics remind me that I bought them on my last visit to the Festival of Quilts at the NEC, before I started quilting seriously. It must be ten years ago. I am going again this year, next week in fact, so I will be interested to see if anything has changed.